Apart from being aware of their eminent international standing within the world of Canadian roots music, my appreciation and knowledge of The Be Good Tanyas is admittedly a little sketchy. The all girl Vancouver based trio have been on a hiatus since 2008 so the decision to resume their performing career and include a Saturday evening Midlands show in their short UK tour was an opportunity not to be missed. 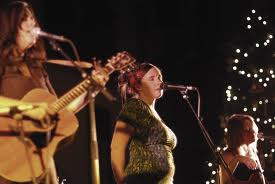 The group have had a recent set back with Sam Parton being unable to join them on this trip due to recovering from a car accident and although Caroline Ballhorn stepped in to offer support vocals, this left main vocalist Frazey Ford and Trish Klein to carry out a bulk of the musical duties between them. The girls had a couple of guys on bass and percussion to add a little rhythm but the focus is very much centered around Frazey’s rootsy distinct vocals and the exceptional versatile guitar and banjo picking from Trish. Throughout the 90 minute set, both Frazey and Trish ably demonstrated why they had received a vast amount of critical acclaim in the first half dozen years of the 21st century, yet there was still something missing in their show that would signpost a prosperous future for the band. The decision to play the 1500 seat capacity Butterworth Hall within the University of Warwick’s luscious arts centre was a touch ambitious with even the lure of a Saturday evening slot being insufficient to getting anywhere near to fill it. Also the onstage vibes didn’t come across positively and as somebody who went along to find out something about them, there was an empty feeling as being none the wiser of their journey or what the future holds. Maybe just a personal view but I believe a period of re-connection with the UK audience would have been required. The set was liberally sprinkled with a host of covers. Some have been recorded by the band such as Neil Young’s ‘For the Turnstile’ and Prince’s ‘When Doves Cry’ while others featured included a slowed down version of ‘Here Comes The Sun’, bluesman Willie Brown’s ‘Future Blues’ and a Pete Rowan number believed to be ‘Midnight Moonlight’. Of the rest ‘Human Thing’, ‘Ootischenia’ and ‘In My Time Dying’ came over well although surprisingly omitted from the set list were two of their apparently more popular songs in ‘The Littlest Birds’ and ‘Light Enough to Travel’. Although no mention was made of future recordings, the unreleased ‘September Field’ gave a hint of what might be possible. Probably the two finest performed songs on the evening were the final two numbers that concluded the encore. Just Frazey and Trish on acoustic guitar re-appeared for the excellent ‘Lakes of Pontchartrain’ while the show closing ‘Gospel Song’ ensured the musical part of the evening ended on a high. By this time the atmosphere had lightened and we were probably witnessing the true Be Good Tanyas. 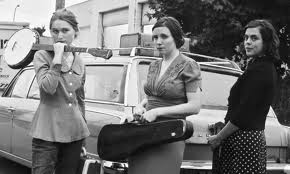 Fellow similar Canadian artists such as The Wailin Jennys, Ruth Moody solo, Cara Luft, Po Girl and the Good Lovelies have all been witnessed live in the UK recently and left a more favourable impression. The talent is indisputable but more is definitely warranted to elevate The Be Good Tanyas into the upper echelons of my live music experience. A special mention needs to be reserved for Emily Portman who opened the show fresh from her recent nationally recognised song writing award. There will no doubt be many more column inches elsewhere in UK folk circles but her honesty, genuine warmth and song interpretation was well received by those present.